HBO released the first series of official photos for Game of Thrones season seven this week. They didn’t spoil much, but there was one reveal that hints at a major plot development next season. We’re talking, of course, about Azor Ahai. 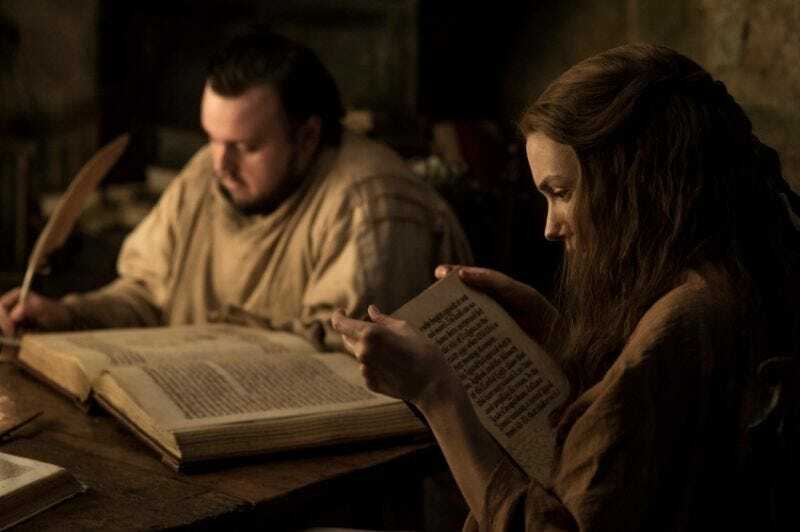 As io9 reported earlier this week, a season seven photo of Samwell and Gilly at the Citadel shows Gilly reading the legend of Azor Ahai, a mythical hero whose resurrection was prophesied by Melisandre. According to a Reddit post, the passage is ripped almost verbatim from George R.R. Martin’s series compendium, A World of Ice and Fire. The legend of Azor Ahai, like many others in the A Song of Ice and Fire universe, is fractured and open to interpretation. It takes place about 8,300 years before the events of Game of Thrones, during the previous White Walker invasion. Legends attributed the White Walkers’ defeat to an alliance between the Children and the First Men, but eastern tradition (including followers of the Lord of Light) insisted those forces were led by a legendary warrior named Azor Ahai. He is not included in Westerosi versions of the story. Azor Ahai was the wielder of Lightbringer, a burning sword that fought the darkness and helped drive back the White Walkers. In the books, Salladhor Saan (that pirate guy we haven’t seen in a few years) told Davos Seaworth all about how Lightbringer, a.k.a. the Red Sword of Heroes, came into being; it took three attempts to successfully make it, and in the end it required a great sacrifice. The first time, Azor spent 30 days and nights on it, but it shattered when placed in water. 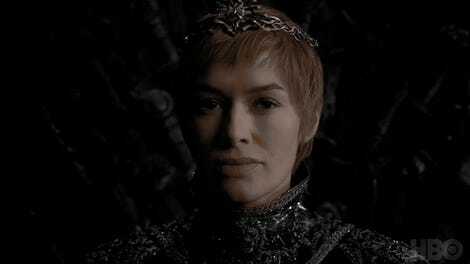 The second time, Azor devoted 50 days and nights, but it shattered when he used it to strike a lion. Then, the third time, he took 100 days to make the sword, plunging it into his wife Nissa Nissa’s heart, thus crafting Lightbringer. Followers of R’hllor, the Lord of Light, believe that Azor Ahai will be resurrected “when the red star bleeds” to return to save the world from the White Walkers once again. This legendary figure may or not may not be tied to the Prince That Was Promised, another prophecy that bears striking similarities to the one about Azor Ahai, albeit with slightly more Christ-like “savior” connotations. Fans believe both prophecies are about the same figure, though that has not been confirmed. Azor Ahai’s prophecy says he will be reborn after the long summer ends to reclaim Lightbringer and save the world. Melisandre insisted for a long time that Azor Ahai was Stannis Baratheon, going so far as to name his sword Lightbringer even though it could not hold heat like its namesake. Well, Stannis is dead now, so that’s not happening. There are plenty of theories on which character is the reincarnated spirit of Azor Ahai, including Tyrion Lannister, Jaime Lannister, and even Khal Drogo. One of the stronger cases is for Jon Snow. In the last season, not only was Snow brought back to life thanks to Melisandre’s magic “for a reason,” it was revealed that Snow is the Secret Targaryen who was born under a bleeding star—i.e., the blood-covered sword of House Dayne, taken by Ned after defeated Arthur Dayne in order to rescue his sister Lyanna, which he was still grasping when Lyanna showed him Jon for the first time. (Also, the Dayne’s sword, named Dawn, was created from a falling star, just to hammer it home.) Plus, in the books, when Melisandre would look into the fires for Azor Ahai, she saw Snow, although admittedly her track record isn’t great. However, there’s an even stronger case for Daenerys Targaryen being Azor Ahai—at least according to Maester Aemon and Kinvara the Red Priestess (who is the show’s substitute for Benerro of Volantis). The prophecy of the Prince That Was Promised, a title Maester Aemon said wasn’t restricted to gender, says the prince would be born amidst smoke and salt, which has been interpreted as Dragonstone. The bleeding star in Azor’s prophecy could refer to what happened after Dany’s “rebirth” in fire at the end of the first season. Shortly after Dany emerged from the funeral pyre, a red comet was seen throughout Westeros. Then, there’s the second part of that prophecy, as shared by Melisandre in A Song of Swords: “Azor Ahai shall be born again...to wake dragons out of stone.” There’s only one person who’s done that so far, and that’s Daenerys. In fact, there are those who believe the dragons themselves are Lightbringer, instead of a physical sword. This interesting post explains how, in the books, Daenerys tried three times to revive the dragon eggs. It wasn’t until the third time, when Daenerys unknowingly sacrificed her unborn son (in an effort to save Khal Drogo, who she later mercy killed and burned on a pyre) that the dragons emerged, much like how Azor Ahai sacrificed Nissa Nissa to make Lightbringer. Since the showrunners only have two abbreviated seasons of Game of Thrones left to make, chances are they know who Azor Ahai is, and it’s most likely a reveal they have been laying the groundwork on for some time now. Game of Thrones finally returns on July 16, but somehow I doubt we’ll get the answer to Azor Ahai’s identity that quick. But at least it will give Sam and Gilly more time to research.